At ACER we recognise that the rapid and dynamic pace of development requires a considered and proactive approach, if we are to manage and mitigate the impacts on our natural environment and resources. 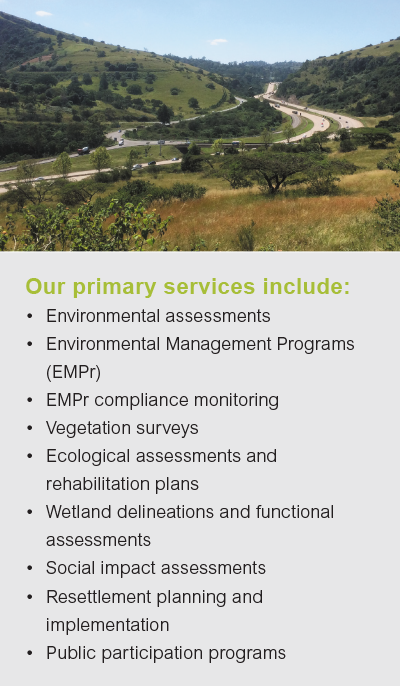 We have therefore expanded our offering to include risk assessments, fauna and flora search and rescue, habitat recreation, indigenous plant nurseries, and sustainability solutions. Water and its sustainable use are of great interest and importance to us. Projects we have worked on include the Thukela Water Project (1995-2001), Olifants River Water Resources Development Programme (De Hoop Dam) (2006-2008) and the Lesotho Highlands Water Project, Phase 2. We have also made contributions to UNEP’s Dams and Development Project’s compendium of relevant practices for improved decision making on dams and their alternatives, and we have played a role in the SADC/EAC Sustainable Water Infrastructure Development Project and the Mekong River Commission’s Sustainable Hydropower Initiative. Hydropower is an area in which we have extensive knowledge and experience. We serve as environmental advisors to Hydro SA (Pty) Ltd, a South African owned and operated hydro electric company. We have managed many lengthy resettlement processes in which our track record is second to none, particularly in Mozambique, where we have undertaken a number of projects. We have worked in various sectors, including: water (bulk, reticulation, waste water and water management), agriculture (in particular, irrigation and sugar), energy (generation, transmission and renewables), communication, industry, transportation, mining, conservation and tourism. We have received five awards for excellence in environmental management: two from the International Association for Impact Assessment (South Africa), two from the South African Institution of Civil Engineering and one from Sasol (Pty) Ltd.